Below you'll find media resources for the Biomimicry Global Design Challenge. Please contact media@biomimicry.org with any questions. Thank you! Learn more about the 2017-18 Launchpad teams and their climate change innovations. You can find information on past Launchpad teams here. 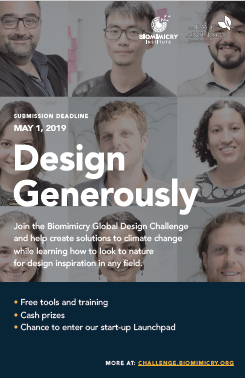 Learn how to design generously through the Biomimicry Global Design Challenge. The Biomimicry Institute and the Ray C. Anderson Foundation are issuing a challenge to look to our planet’s living systems to create climate change solutions that give more to the planet than they take. Learn biomimicry in action, plus get the chance to win cash prizes. Challenge winners are invited to join the Biomimicry Launchpad to compete for the Ray C. Anderson Foundation $100,000 Ray of Hope Prize®. Visit challenge.biomimicry.org to register and learn more. Can human designs give more to the planet than they take? 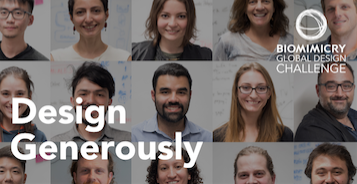 We challenge you to design generously in the Biomimicry Global Design Challenge. Our planet’s climate change problems are getting worse. To reverse course, we need a new generation of innovators, who know how to create man-made materials, products, and systems that are regenerative, circular, and generous to all species. The Biomimicry Institute and the Ray C. Anderson Foundation are issuing a challenge to look to our planet’s living systems to create solutions to address energy consumption, greenhouse gas emissions, food systems, transportation, water management, coastal communities, fossil fuel usage, and more. You’ll learn biomimicry in action, plus get the chance to win cash prizes. Challenge winners are invited to join the Biomimicry Launchpad and compete for the Ray C. Anderson Foundation $100,000 Ray of Hope Prize®. Visit challenge.biomimicry.org to register and learn more.